Soft paws have been a miraculous solution for my Shepherd’s toenails. He drags his front toes when he walks and had worn down his nails deep into the quick causing significant bleeding. 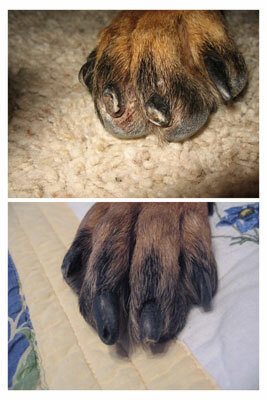 The photo shows the protection and growth that Soft paws has allowed after only eight weeks. The Soft paws don’t seem bother him at all and have no effect on his walking. Thank you! So far Tryp doesn’t seem to feel or see them so has not tried to take them off or chew on them. This is remarkable in that he is the type of dog that requires 3 people and 2 hours to cut his nails! After the first was put on, he cooperated fully, and it was an easy process. 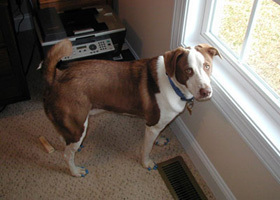 I am hoping this will solve the problem of his scratching people when he gets excited and jumps up on them. Great Idea, Thanks! These Soft paws are great! My husband and I just bought a place with hardwood floors and our dog was scratching the floors terribly with her nails. Trimming the nails was not working. The Soft paws work great. No more scratches. I think next time we’ll try the blue ones. I love Soft paws! I have two dogs, a big one and a little one, and Soft paws have solved a couple of problems for me. Now the big dog doesn't scar up my hardwood floors with his big old claws and I can let him go anywhere in the house. The little one jumps up when he's glad to see me and used to tear my pantihose, but no more. Since I got Soft paws the dogs and I are all happier. Thanks! I am writing to tell you how pleased my little "Maggie" and I are with your wonderful product! When my daughter told me about the little caps for Maggie's paws that I could purchase I was somewhat skeptical, but intrigued none the less. Maggie is a darling little miniature poodle who has a problematic habit of jumping upon my guests legs when they visit my home. I am almost 79 and most of my friends here at the Park are elderly also. I suppose I don't have to tell you that your skin certainly seems to thin with age and Maggie's jumping and pawing was causing quite a bit of pain for my dear friends. With her cute pink Soft paws however, no more damage is done or pain inflicted, and I do believe I don't have to worry about being expelled from our Bridge group! Thank you again dear so much for these wonderful "Soft paws".